Last year, ULAS undertook an archaeological excavation at the proposed new Stamford AFC stadium at Ryhall Road, north of Stamford, Lincolnshire. The work was commissioned by the Burghley House Preservation Trust with R G Carter as the main site contractor. Features discovered date to the late Iron Age and early Roman period. Two large boundary ditches were seen on the north and south of the site with smaller east to west gullies dividing the area between into smaller enclosures. Settlement activity was confined towards the western end of the site with evidence of a single roundhouse set within a larger enclosure. The lack of roundhouses, or even structures, over the rest of the site would suggest that much of the excavated area was used for some form of agricultural activity which had clear boundaries to the north and south. The cross-gullies may have acted as holding pens to contain animals ready for milking or shearing or other regular activity. Most of the pottery was of East Midlands Scored Ware type with a probable date likely to be between the 1st century BC and the 1st century AD. Occupation changed post-Conquest, the boundary ditches were filled in and the area appears to have changed from an agricultural environment to a more industrial one. Later industrial activity was uncovered in the form of two very well preserved pottery kilns, one with the stone kiln furniture still in-situ. Pottery from the kilns suggests that the predominant products being manufactured were jars, along with straight sided dishes with beaded rims, most likely during the middle of the 2nd century AD. 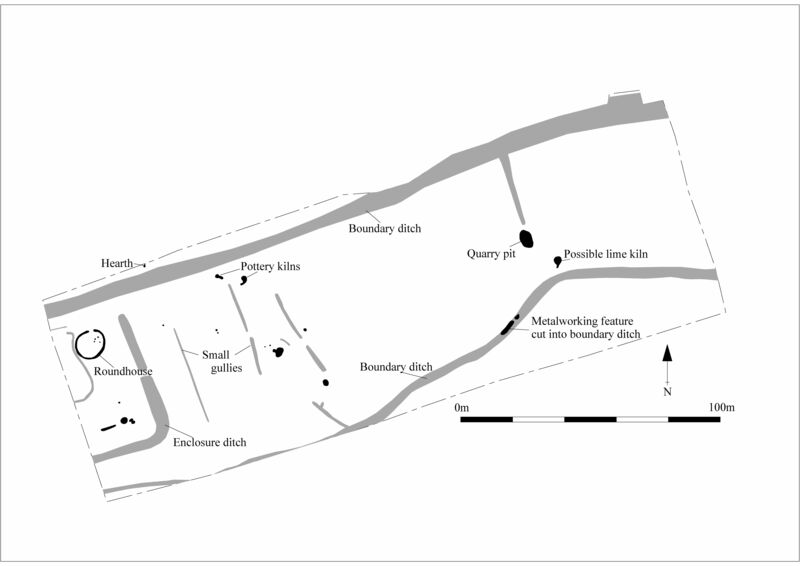 Evidence of metalworking was observed further to the east of the kilns in the form of a possible hearth cut into the backfilled boundary ditch. A probable lime kiln and small quarry pit were also recorded which may be of significantly later date.